It takes a lot of teamwork to build trails, that teamwork goes beyond four or five people working in the woods. For the AMC Trails Department, we call it cooperation. AMC, USFS, NHDP, MBPL, ATC, and private entities are in constant cooperation with one another when it comes to efforts to conserve our natural resources within the White Mountains. This summer the AMC and USFS have boots on the ground cooperation. While the AMC has it's own trails to maintain we need to remember that there are many trails out there that are just as popular, get just has much use, and are in need of TLC that aren't AMC trails. AMC Trail Crews have been working with the WMNF-FS on Champney Falls, Osceola, and at Hermit Lake. If you've been to the scenic falls, hiked Osceola off the Tripoli Rd. 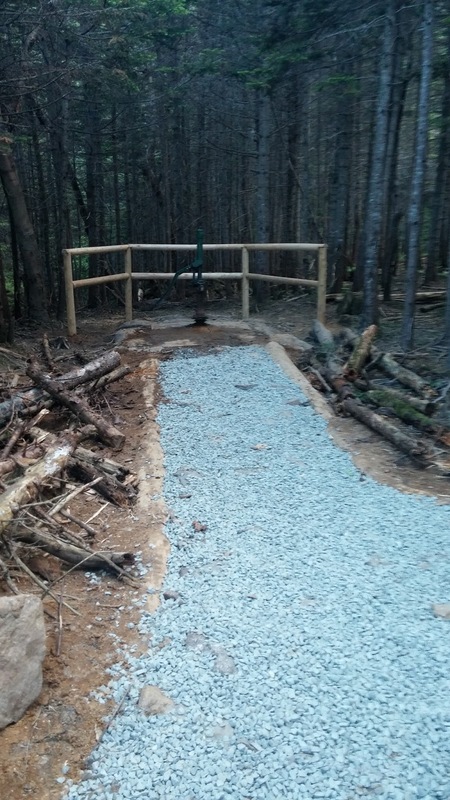 or scurried up the Tux Trail with family to Lunch rocks then you've likely seen a lot of people enjoying the outdoors, and you've likely seen what high use, soil compaction, and water can go to these popular yet beautiful spaces. Hermit Lake water pump in Spring of 2014. Crews spent a couple days at Hermit Lake hardening the area leading into the water pump. AMC crews actually started in 2014 by setting rocks around the the concrete pad, note the amount of soil lost. 2015 crews installed fencing, and built a turnpike to help keep the area dry and provide a durable walking surface with hopes that the immediate area doesn't loose any more soil and that it can slowly revegetate on the fringes where hiker impact had been expanding. Hermit Lake water pump, 2015. In another effort of cooperation, the AMC Trails Department would like to thanks Jed Talbot, trail builder and owner of Off The Beaten Path for his help with the leading a rock shaping demo for the crew. Jed is great! He has worked with both the AMC and WMNF-FS on projects and trainings for years. Using rifting hammers and strikers. Rock splitting via drilling, feather and wedges, and rifting.